There’s something special about the food you enjoy in Italy, something different. It’s not that the restaurants are using an array of secret ingredients or employing arcane or complicated cooking techniques. It’s very much the opposite, in fact—generally the dishes have few ingredients and the preparation usually is quite simple. Yet, the meals in Italy consistently stand out among the best. It’s almost as though the ingredients themselves instinctively know what to do, or they’re charmed by the chef into combining with each other in ways that exceed the dish’s potential. As a result, the food is both humble and humbling. It’s challenging to find an Italian restaurant here that can truly recreate that experience (though there are some that come close). But with the opening of Marc Vetri and Jeff Benjamin’s Osteria, the landscape has vastly improved. In Italy, restaurants are identified either as a ristorante, trattoria or osteria. Today, the names don’t carry the hierarchal meanings they once did, but back in the day they acted as a classification system. If the restaurant was called a ristorante, for example, you could expect a formal dining experience—a wine list, white table cloths and, of course, a price tag to match. A trattoria was more casual, but it did serve full, hearty meals. And an osteria was the least formal of the three—it was more of a gathering place that served wine and maybe some basic food. At Vetri and Benjamin’s Osteria, the large wooden tables and the long dinner bar—perfect for those dining solo or couples hoping to sneak in without a reservation—help to capture the warm, rustic, communal spirit of the traditional osteria. Yet, like many of the osterias and trattorias in modern-day Italy, Osteria is more upscale than its name would suggest. And although the prices of some of the dishes here are closer to what you’d expect to pay at a traditional ristorante, the food is worth it. Osteria's take on Northern Italian cuisine is authentic enough to make you nostalgic for the Old Country even if you’ve never been there. 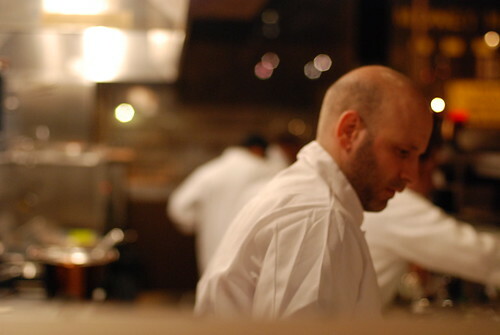 But at the same time, Osteria makes the dishes its own, all the while somehow managing to keep it all simple. 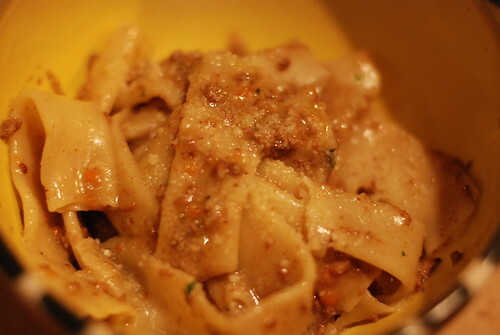 For example, pappardelle with boar meat is a classic Umbrian staple. Osteria, however, takes this dish to the next level by substituting the pappardelle with long, tubular, home-made candele and by using just enough rosemary to highlight the flavor of the boar. As a result, the Candele with Wild Boar Bolognese is a reliable winner that has become one of Osteria's most popular dishes ($16.00—only around four dollars more than you’d pay in Italy for the pasta course, given current exchange rates). Sadly, this tasty bowl of heaven does not appear on the spring menu, which debuted last week. However, the Candele should return on the fall menu and hopefully will make guest appearances in the spring from time to time. In its place, though, are some worthy substitutes. 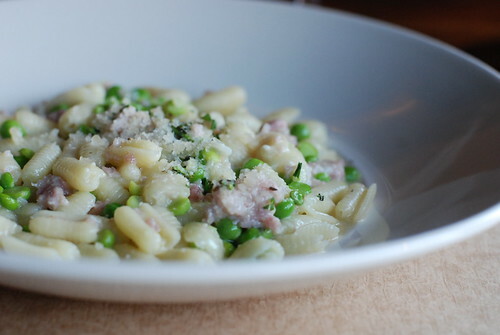 The newly-added Gnocchi Sardi with Proscuitto and English Peas ($16 for a full portion, half serving pictured) screams spring. Some of the pasta water is mixed with a little parmesan cheese to create a light sauce, while the peas taste so fresh and crisp you’d swear you were eating them right out of the pod. 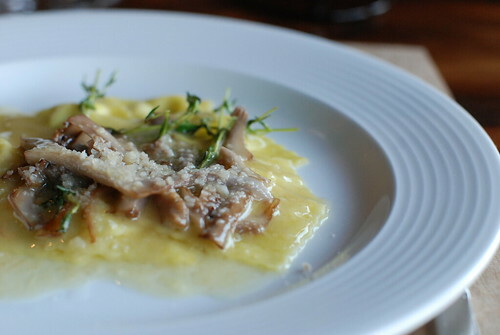 The spring menu also features the Robiola Francobolli with Bluefoot Mushrooms ($16 for a full portion, half serving pictured). The silky and transparent Francobolli are barely thick enough to last more than a few seconds in your mouth before they melt, releasing the rich and creamy goat’s milk cheese known as Robiola. Combined with the meaty Bluefoot, you’ll enjoy a dish that’s rich and satisfying, yet light and delicate enough for spring time. 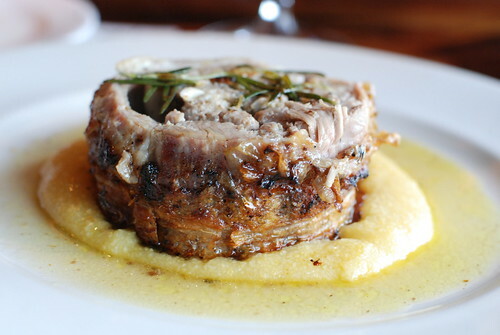 The most compelling and decadent addition to the spring menu is the mouth-watering Stuffed Baby Lamb “allo Spiedo” with Soft Polenta and Rosemary ($30). The baby lamb is de-boned and filled with a stuffing made from the liver, kidneys and leg meat. It’s then all tied together, roasted on a spit with thyme and rosemary, sliced and served on a warm pillow of polenta. These stunningly fresh, rich flavors are transcendent, making this second course well worth the money. In Italy, most osterias and trattorias offer a simple, inexpensive house wine by the carafe; it’s part of the culture. Osteria does not participate in this humble tradition. But you’ll barely miss it. Sommeliers Karina Lyons (formerly with Susanna Foo) and Brett Taylor enthusiastically guide customers through a well-crafted, all-Italian wine list that is both fun and amazingly affordable, offering wines by the bottle, glass and quartina (a mini-carafe, about two glasses). As I have said elsewhere, the one thing you give up at a BYOB in Philadelphia is the wine service—the skills of a seasoned professional who can make recommendations that will make both the wine and the meal taste better than they would alone. 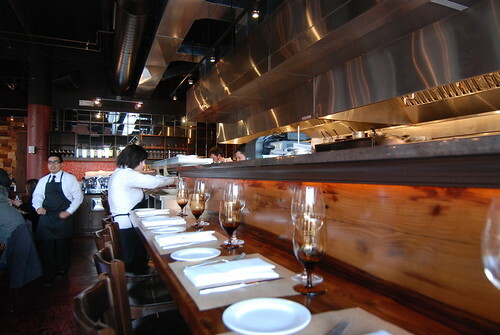 Osteria delivers an impressive wine service that is hard to match. I’ve watched Ms. Lyons gently and diplomatically steer customers away from unwise pairings and then suggest a more appropriate and less-expensive alternative—a rare combination of skills. One of the more exciting reds on the list is the Tommaso Bussola “BG” Valpolicella Classico DOC 2004 ($10/glass). The nose carries a strong peaty fragrance of nutrient-rich earth, but the palate is surprisingly light and refreshing, with red berry flavors. And the wine’s virtually non-existent tannins and bright acids make it rather versatile with lighter fare. It’s hard to go wrong with a dessert menu that features home-made gems such as gelati and chocolate flan. But the dessert here that should not be overlooked is the inventive yet unassuming Polenta Budino ($8), which is guaranteed to evoke your most carefree childhood memory. Osteria mixes sugar with the polenta instead of salt, giving it an almost cookie-dough-like flavor. 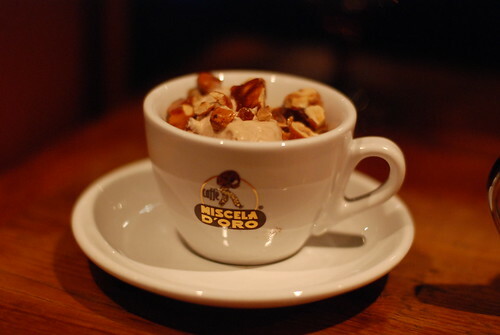 A dollop of hazelnut mousse is added and topped with hazelnuts candied with peanut brittle. It’s like watching Saturday morning cartoons with your favorite bowl of cereal. 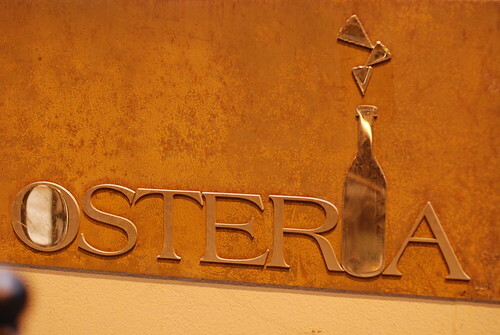 For more Osteria pics, go here. If you’ve read my profile recently, you know I’ve been taking classes at The Wine School of Philadelphia, which was founded by Keith Wallace. The classes have been validating in a lot of ways; the analytical way I have been approaching and deconstructing wine is directly in line with the school’s philosophy. At the same time, though, Keith and his colleague, Brian Freedman, have taught me so many new things. As a result, the course has been profoundly empowering—I’ve learned to identify characteristics about a wine from just one sip that I never thought were possible, things that highly-paid sommeliers can’t identify. It’s scary, actually. The funny thing is that you could do it too. It’s not supernatural. In fact, it’s imminently teachable. When the City Paper put out the call for freelance writers, I pitched a piece on The Wine School of Philadelphia and they liked it. The article I wrote appears in this week’s issue of the City Paper. In addition to the Foundation Program I wrote about, The Wine School also offers individual classes that are rooted in the same sensory-based philosophy for as low as $37.99. 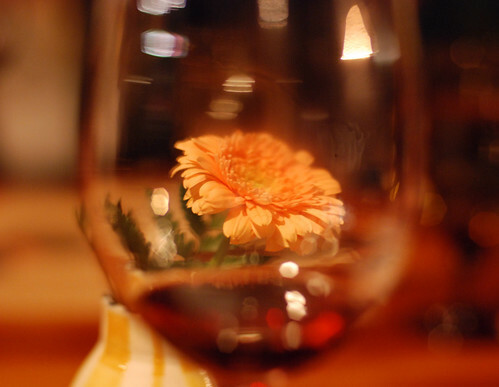 In Wine 101, for example, they cover the nine basic varietals and dispel popular myths about wine, including the sulfite myth and the belief that you need a different glass for each type of wine. Also, please check out this week's Small Bites section of City Paper. I profile the Argiolas 2005 Costamolino Vermentino. The creaminess I describe is the result of a process known as partial malolactic fermentation, which I was able to identify instinctively thanks to the skills I learned from Keith and Brian. Even though I’ve been back from vacation for a couple of weeks, my blogging hiatus has been longer than I originally expected. A few other things took priority: work, a brief bout with a bug that’s making its rounds, a couple of non-blog-related writing deadlines, and a protracted battle with USAirways over a special piece of luggage they improperly refused to allow me to check at Rome’s airport (I eventually won; being a lawyer, I usually win these battles). I will blog about the USAirways situation in detail soon, not only because it directly relates to the subject of this blog, but more importantly, because it was a victory for consumers. I’m not exaggerating when I say that everyone who leaves Rome flying USAirways could benefit from the work I did to resolve this issue. For those who are interested, I’m in the process of posting pics of the Italy trip (Rome, Florence and Venice) on my Flickr page—first the sights, then (of course) the food. A restaurant review is on the way, so please check back in a day or so.